Product - Shot Glass Chess and Checkers Game Set- 2 in 1 Drinking Game Set for Party or Game Night with Glass Game Board and 32 Shot Glasses by Hey! Play! 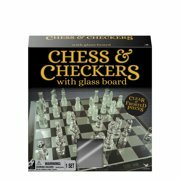 Shot Glass Chess and Checkers Game Set- 2 in 1 Drinking Game Set for Party or Game Night with Glass Game Board and 32 Shot Glasses by Hey! Play! Product - Wooden Book Style Chess Set, Chess Board with Staunton Chessmen by Hey! Play! Wooden Book Style Chess Set, Chess Board with Staunton Chessmen by Hey! Play! Product - Elegant Inlaid Wood Chess Set Cabinet with Staunton Wood Chessmen by Hey! Play! Elegant Inlaid Wood Chess Set Cabinet with Staunton Wood Chessmen by Hey! Play! Product - Classic Chess Set, Walnut Wood Board, 12"
Classic Chess Set, Walnut Wood Board, 12"
Product - Luxury Chess Board, Redwood with Rounded Corners, 21"
Luxury Chess Board, Redwood with Rounded Corners, 21"